Western blot analysis of extracts from mouse and rat brain using TrK (pan) (A7H6R) Rabbit mAb (Biotinylated). 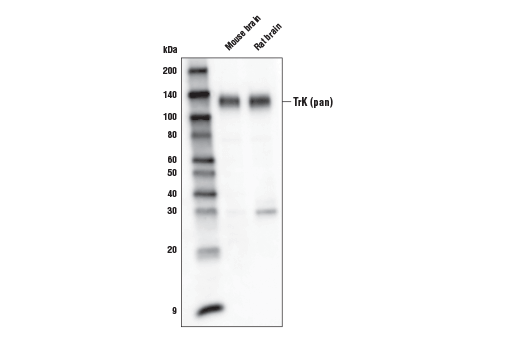 Trk (pan) (A7H6R) Rabbit mAb (Biotinylated) detects endogenous levels of total Trk protein. This antibody detects TrkA, TrkB and TrkC. However, the antibody may perferentially detect TrkA over TrkB and TrkB over TrkC. Monoclonal antibody is produced by immunizing animals with a synthetic peptide surrounding Tyr791 of human TrkA. This Cell Signaling Technology antibody is conjugated to biotin under optimal conditions. The biotinylated antibody is expected to exhibit the same species cross-reactivity as the unconjugated Trk (pan) (A7H6R) Rabbit mAb #92991. The family of Trk receptor tyrosine kinases consists of TrkA, TrkB, and TrkC. While the sequence of these family members is highly conserved, they are activated by different neurotrophins: TrkA by NGF, TrkB by BDNF or NT4, and TrkC by NT3 (1). Neurotrophin signaling through these receptors regulates a number of physiological processes, such as cell survival, proliferation, neural development, and axon and dendrite growth and patterning (1). In the adult nervous system, the Trk receptors regulate synaptic strength and plasticity. TrkA regulates proliferation and is important for development and maturation of the nervous system (2). Phosphorylation at Tyr490 is required for Shc association and activation of the Ras-MAP kinase cascade (3,4). Residues Tyr674/675 lie within the catalytic domain, and phosphorylation at these sites reflects TrkA kinase activity (3-6). Point mutations, deletions, and chromosomal rearrangements (chimeras) cause ligand-independent receptor dimerization and activation of TrkA (7-10). TrkA is activated in many malignancies including breast, ovarian, prostate, and thyroid carcinomas (8-13). Research studies suggest that expression of TrkA in neuroblastomas may be a good prognostic marker as TrkA signals growth arrest and differentiation of cells originating from the neural crest (10). Huang, E.J. and Reichardt, L.F. (2003) Annu Rev Biochem 72, 609-42. Segal, R.A. and Greenberg, M.E. (1996) Annu Rev Neurosci 19, 463-89. Stephens, R.M. et al. (1994) Neuron 12, 691-705. Marsh, H.N. et al. (2003) J Cell Biol 163, 999-1010. Obermeier, A. et al. (1993) EMBO J 12, 933-41. Obermeier, A. et al. (1994) EMBO J 13, 1585-90. Arevalo, J.C. et al. (2001) Oncogene 20, 1229-34. Reuther, G.W. et al. (2000) Mol Cell Biol 20, 8655-66. Greco, A. et al. (1997) Genes Chromosomes Cancer 19, 112-23. Pierotti, M.A. and Greco, A. (2006) Cancer Lett 232, 90-8. Lagadec, C. et al. (2009) Oncogene 28, 1960-70. Greco, A. et al. (2010) Mol Cell Endocrinol 321, 44-9. Ødegaard, E. et al. (2007) Hum Pathol 38, 140-6.